While President George W. Bush has appointed two Supreme Court justices during his terms in office, the next president may be in a position to appoint up to three new justices, replacing one third of the Court. This relatively high number could drastically alter future Supreme Court rulings. Now is the perfect time to consider the role of politics in Supreme Court nominations and in the new appointees’ ensuing decisions. In The Court and the Cross, legal journalist Frederick Lane reveals how one political movement, the Religious Right, has dedicated much of the last thirty years to molding the federal judiciary, always with an eye toward getting their choices onto the Supreme Court. This political work has involved grassroots campaigns, aggressive lobbying, and a well-tended career path for conservative law students and attorneys, and it has been incredibly effective in influencing major Court decisions on a range of important social issues. Recent decisions by the Right’s favored judges have chipped away at laws banning prayer in school, bolstered restrictions on women’s access to abortion and birth control, and given legal approval to President Bush’s use of federal funds for religious organizations. In the near future, the courts will confront a host of hot-button issues, from stem cell research and gay rights to religious expression on government property and euthanasia. As the courts hear cases driven by an evangelical agenda and tainted with religious rhetoric, Lane surveys the damage to the wall separating church and state and asks, Has the Religious Right done irreparable harm? As a new president takes office, it is more important than ever to understand the political and social forces behind the Supreme Court nomination process. 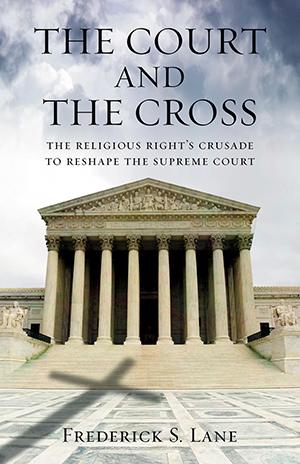 The Court and the Cross is a revealing look at how much has already been lost, thanks to the concerted efforts of the Religious Right to change the Court, and a timely warning of how much more we could yet lose. "Credit freelance journalist Lane for an exceptional insightful work illuminating both the history of America's civil courts, and for showing how their evolution has brought us to where we are today." "Lane, a legal journalist, . . . examine[s] in depth the current theocon threats to religious liberty and church-state separation. He shows how the Religious Right, frustrated by their failure to achieve all of their goals through the legislative and executive routes, have concentrated their efforts over the last 30 years on electing presidents who will appoint federal judges and Supreme Court justices who will dismantle the already eroded wall of separation between church and state. The US Supreme Court is the great prize, the theocons' Holy Grail, and it appears to be near their grasp . . . Lane's thorough knowledge of the law and the Supreme Court rulings of the last century allow him to deal thoroughly and authoritatively with the long running controversies over school vouchers, public school prayer, religion in the workplace, charitable choice, reproductive rights, and other issues. Lane paints a clear, detailed picture of how the Religious Right developed, how it operates, and what will befall our country if they are not stopped . . . Given the supreme importance of this year's presidential and congressional elections, Lane's book is clearly indispensable."